This section is for people who are looking for non-pesticide ways to get rid of existing weeds. This will be an open forum, meaning we'd like to hear from you if you have found something that works and are willing to share it with the gardening world. In other posts we will talk about building up and balancing the soil and improving overall grass health as deterrents to weeds. We want to limit this section to home remedies or natural products that have shown good results. Borax laundry powder contains the element boron, one of the minor plant nutrients. Excessive boron is toxic to plants. However, University of Iowa research found that Ground Ivy ( creeping charlie) is more sensitive to boron than northern turfgrasses. By applying Borax at a rate that is toxic to Ground Ivy, but not strong enough to kill turfgrass, you can safely eliminate some of this invasive weed. You may also get some dieback on clover and a few other weeds. Precautionary note. Do not use a watering can to apply. Use a pump or hand sprayer only. If your lawn turns yellow from the borax, water thoroughly to move the boron through the soil. Do not treat again if the lawn is sensitive to the borax. Mix 10 oz. (1 1/4th cup) of Borax in 1 gallon of hot water in a hand pump sprayer. Shake or stir really well until completely dissolved. Then mix in a tablespoon of dish soap. Apply early in the day before the heat closes the pores of the plants. The time period when the dew has mostly dried off would be ideal. Or apply in the evening after sunset. Set your sprayer to a fine spray pattern. Simply coat all visible Ground Ivy with your spray solution. One gallon should cover up to 1000 sf. Repeat the application in two weeks if the grass shows no sign of boron sensitivity (yellowing). For small areas using a hand spray bottle, dissolve 5 teaspoons of Borax in a quart of water. This will cover 25 square feet. ALL-PURPOSE WEED and VEGETATION KILLER. Caution – this will kill grass too! Mix 1 cup of regular table salt with 1 gallon or white vinegar in a 1 gallon pump sprayer. Shake really well until the salt dissolves fully. Then add 1 tablespoon of liquid dish soap and shake a bit or stir to mix it in. For a smaller batch mix in a 1 quart trigger spray bottle using 1/4 cup of salt with 1 quart of vinegar and then a teaspoon of dish soap. The easiest way to apply is to set your hand sprayer or pump sprayer to a coarse mist and spray the leaves of undesirable plants. That is where it will be absorbed most easily. Try to get the undersides of the leaves where possible. Just wet the leaves and don't waste your ingredients trying to spray stems. If you are spraying to kill grass then just wet the leaf blades. You may have to repeat these applications once or twice to fully kill the weed. Plants with well developed root systems may be able to recover from the initial spraying so if you see any signs of life 5-7 days later, hit them again. Remember to apply early in the day before the heat closes the pores of the plants. The time period when the dew has mostly dried off would be ideal. DO NOT use a sprayer if you are trying to kill weeds in a lawn or weeds that are nestled in between desirable plants. You'll kill the grass or plants too. Instead, get a small paintbrush and paint the leaves of the unwanted plant with your solution. (This paintbrush idea will also work for those of you who want to use Round-up on weeds or undesirable grass types in the lawn). Never pour this solution on garden or lawn areas. The excessive salt could ruin the soil and prevent anything at all from growing. Written by Stuart Franklin, President of Nature's Lawn & Garden, Inc. All rights reserved. The only natural pre-emergent I know of is Corn Gluten Meal. But you can do a lot by fertilizing heavier in the late spring, or early summer before crabgrass sprouts. This will get the lawn thicker and more aggressive, which can help crowd out weeds. Keep the grass high too. Read our article "All About Crabgrass" in our seasonal tips section, for other tips. Any suggestions on a pre emergent for weeds? Thank you for this. People...please educate yourself on potential harmful effects before adding something new to your environment. It is a tricky subject. I'll email you directly. Looking for help to eliminate bentgrass. Any suggestions? Is this safe for children and dogs who play in the yard? How long is the wait time if not? Do you know how to get rid of chicweed? My backyard has lots of creeping Charlie and I've not found anything to rid it besides pulling by hand. Will def have to give this a try. 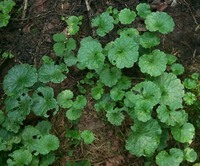 Thank you for the information on controling ground ivy, I will give it a try. However, in additon to ground ivy being in my grass I also have several areas of clover. I have tried weed killer, but it just leaves bare spots in my lawn where the clover was growing. Is there any method of killing the clover other than the use of weed killer? Thank you!